Have you met Emily and Louis? Emily Bruel, suffers a rude awakening at the hands of her philandering older husband when she realizes their marriage must’ve been one big lie. She is forced, for the sake of her children and fleeing sanity, to rewind their too-good-to-be-true life together and find the pieces of herself she's lost along the way. “It Must Have Been Love” by Roxette should help set the mood. Love In Rewind is part one of the Audio Fools trilogy, an adult romance series that follows the love lives of two best friends—Emily and Sara. Their road to love materializes and crumbles to a backdrop of ‘80s music as the anthem to their existence. Come see me at BOOK BONANZA on July 20-21, 2018 in Denver, Colorado! Join me at the first annual Book Bonanza!!! The weekend will consist of panel discussions, signings and a vendor expo. 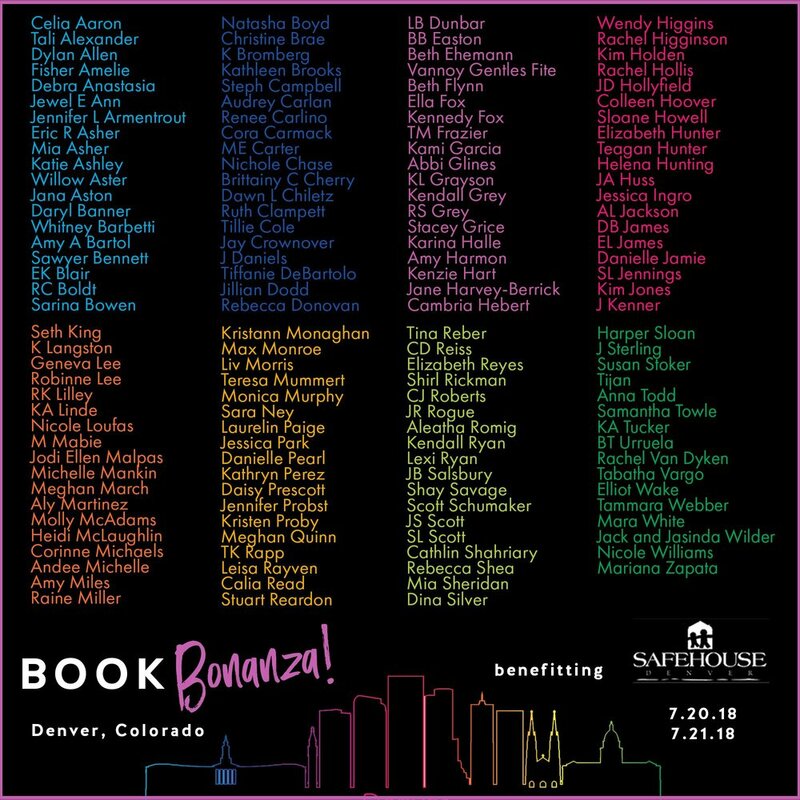 The proceeds from Book Bonanza 2018 will benefit Safehouse Denver. Safehouse Denver serves victims of domestic violence and their children through both an emergency shelter and a non-residential Counseling and Advocacy Center. LOVE IN REWIND is FREE for the first time EVER!!! Listen to LOVE IN REWIND for FREE!!! of LOVE IN REWIND when you sign up for your Free 30-day Audible Trial. Listen to Emily and Louis come to life with over 10 hrs of unabridged dual narration that will melt your headphones off. Emily & Louis Bruel in their NYC treehouse from inside the pages of LOVE IN REWIND by Tali Alexander. Where Are My East Coast Readers? See you at the "C.O.P.A. Authors in New York" Book Signing!!! As 2016 comes to an end, on behalf of myself and all of my fictional characters, whom you've welcomed inside your hearts, we wish you a happy and healthy holiday season and a very prosperous New Year!!! The complete LOVE IN REWIND three book box set, which includes: LOVE IN REWIND, LIES IN REWIND & LOST IN REWIND will be available on Wednesday December 14th, in both e-book and an 800 page paperback. Add LOVE IN REWIND: The Complete Series to your TBR list on Goodreads today!!! Free BookPlates for a limited time!!! USA Today gets a peek inside Tali Alexander's closet!!! Read the full USA Today interview and find out what's Tali's favorite snack of choice while writing and which TV show she's recently binge-watched. Tali Alexander in the NY Daily News!!! Read the full interview by pressing the image. LOST IN REWIND is Now LIVE on Amazon!!! LOST IN REWIND is now LIVE and available on Amazon and FREE with Kindle Unlimited (KU)!!! A key opens a door where lies are revealed, and truths get retold, while the music continues to play on as destiny patiently awaits. After being loved and lied to it's time to be lost in rewind, because no matter what you do, no matter how far away you run, what’s written in the stars cannot be undone. LOVE IN REWIND is on SALE for 99¢!!! LOVE IN REWIND is book one of a three book series called: AUDIO FOOLS. This adult romance series follows the love lives of two best friends; Emily and Sara. Their road to love materializes and crumbles with the help of ‘80s music as the anthem to their existence. LOVE IN REWIND is an interconnected standalone. Sign up with your email address to receive the latest news and updates from Tali Alexander.